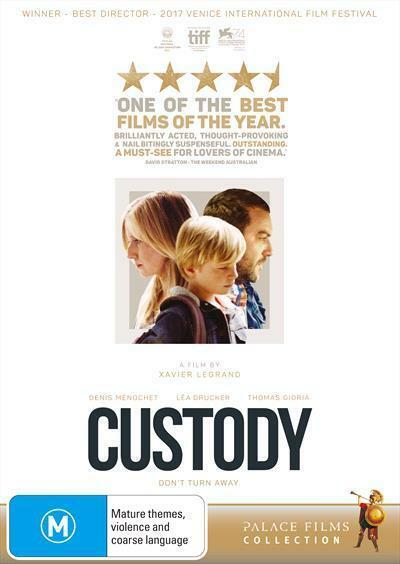 The astonishing, break-out critical discovery of the Venice Film Festival, where it was awarded Best Director and Best Debut Film, Xavier Legrands heart-stopping French drama CUSTODY charts a familys struggles with the fallout of divorce, and the resulting impact on the two children. Miriam (La Drucker, The Blue Room) and Antoine (Denis Mnochet, The Returned) have recently separated. While shes willing to permit their 17-year-old daughter Josephine (Mathilde Auneveux) to decide living arrangements for herself, Miriam is desperate to keep her youngest, 11-year-old Julien (Thomas Gioria), away from his father. But the magistrate rules in favour of joint-custody, and suddenly the boy is thrown directly into the middle of an escalating parental conflict, where it seems inevitable that sides must be chosen. Superbly observed and flawlessly acted (the heartrending performances of the two children are more than worth the price of admission), Legrands precise dissection of this family dynamic masterfully builds into a pulse-pounding thriller. Honest, yet still evoking profound sympathy for all its protagonists, CUSTODY is sure to be remembered as one of the most important and vital films of 2018.